Mark was born in Penzance, Cornwall. It is a county that has a rich history in art and played an important influence in Mark’s development as an artist. He gained invaluable experience working with three renowned artists in St Ives before studying Fine Art Sculpture at Loughborough University. Upon graduating, Mark won the Queen Elizabeth Scholarship grant to study Bronze Casting at the Le Blanc Fine Art. The experience gained here enabled Mark to become a bronze sculptor in his own right culminating in a variety of commission work as well as exhibiting his work extensively across the UK and abroad. His work is mainly figurative and draws inspiration from nature and ancient cultures. 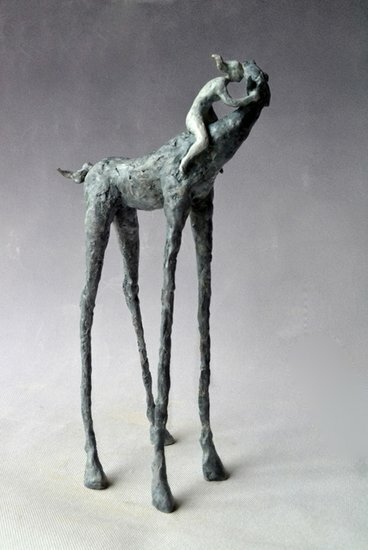 He states "Bronze is my preferred medium due to its tactile qualities and aura of permanence. It encompasses thousands of years of history and is a technique that has changed very little to this day, something very rare in our modern society".